Denture cleaning is essential to ensure optimal oral health and longevity of your dentures. Here at Smile Denture and Implant Clinic, we offer professional denture cleaning and professional denture cleaner. Our professional denture cleaning is best suitable for older dentures that are stained and have lot of plaque build up. On the other hand, denture cleaning solution is perfect to keep your dentures clean and prevent stains and plaque over the long term. At our clinic, we offer Novadent denture cleaning solution for our valued patients. Always clean your dentures over a bowl of water or a folded towel to avoid dropping them. To clean your dentures, the general rule is: brush and soak your dentures every day. Brush your dentures first with denture brush to help remove any bits of food. Use a non-abrasive and special denture cleaner, not regular toothpaste. Be careful not to scrub too hard as this may damage your dentures. Make sure you brush all the surfaces of the dentures, including the surface that fits against your gums. Soak your dentures every day in a denture-cleaning solution. This will help remove any plaque and stubborn stains that are left. It will also help to disinfect your dentures, leaving them feeling fresher. You should also clean your dentures every night, before going to bed. 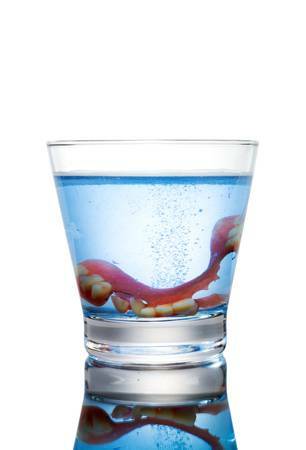 Ideally you should leave them to soak overnight in water with denture solution. You should use a toothbrush or ideally a denture brush to clean off food debris. You can do this without any special products by using water. After that, you can place your dentures in denture solution for various time durations. The longer you keep your dentures in denture solution, the cleaner your dentures will be. You should always keep your dentures in the solution for at least 15-30 minutes. Most of our patients are happy with Novadent solution that we offer which provides for deep cleaning of dentures on implants and soft liner. Each Novadent sachet contains a cleansing solution specially formulated to remain active for 7 days. The best denture cleaning will be achieved at our clinic or with use of a high quality ultrasonic cleaner. Ultrasonic cleaner is one of the best ways to guarantee that you get your dentures are completely clean. What Should I Avoid When Cleaning Dentures? It is important not to use any type of bleaching product to clean your dentures. Bleaching can lead to weakening of the dentures as well as make them prone to staining. Also, do not use very hot water to soak your dentures. Again, it can weaken the dentures over time causing them to break. If you are in need of denture cleaning, contact us today to get your dentures looking like new! Also, if you are considering dentures as a solution for replacing your missing teeth, we invite you to visit our Ottawa Denture Clinic. We offer a full spectrum of dentures and denture implant solutions that are suitable for everyone’s budget and needs. We are happy to discuss both regular and high end dentures services that we offer. You can contact us at 613.262.6332. for a free assessment and a free complimentary consultation. Let us help you restore your beautiful smile today!